Check out our latest Amish Records Blog Entries! Amish Records was founded in Pennsylvania and began releasing 7"s in 1994. Since then they've moved to New York and have accumulated an eclectic catalog of music rooted in the folk tradition, ranging from Oakley Hall's harmonized bluegrass-inspired Americana to the spacious psychedelic soundscapes of Hall of Fame (Dan Brown/Samara Lubelski/Theo Angell); from Bird Show's electronic/jazz meditations to Black Taj's Chapel Hill-style classic rock reinterpretations. Before I say anything more, I've been warned by the Amish website: "we'd rather be listening to records than reading what blogs and/or bad music writers are championing as the 'new best thing since [fill in the blank].' Though these terms are often bandied about as signifiers of cool or as a coded form of insider-speak, very little holds up through time. Don't embarass yourself or your music by catering to these trends. Have you seen what today is being pimped as 'New Weird America'? To us, it looks like a bunch of kids dressing up for Halloween and playing Manson while their parents are away on business." For a label that's been releasing various strains of folk music from the beginning, it's easy to understand their distaste for such trend-mongering. At least no one on the Amish label has appeared on a Volkswagen commercial or is dating Chloe Sevigny, Winona Ryder, or an Olsen twin. Let's hope it stays that way. That being said, one could call Amish an early supporter of "New Weird America". However, as much as that genre has been touted as a community or a movement, music catagorized this way mostly reminds me of a person or place that existed long ago, someone or someplace just beyond the horizon, or maybe more accurately no one and no place at all. Mike Wexler makes just such out of time and place music on his records. "I'd Like to Solve the Puzzle" was my introduction to his songs, his idiosyncratic vocals and mystical lyrics sounding like a sober Devendra Banhart or a warlock incarnation of Jeff Mangum. 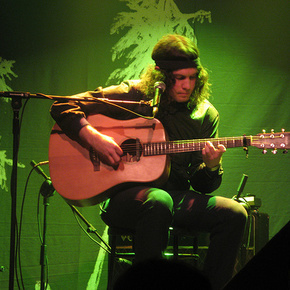 There's something refined, almost chivalrous about his songs, I can almost imagine him kneeling in a medieval tapestry. Like what a court composer would play as two lovers lock eyes in a Shakespearean tragedy, romantic longings weighted down by premonitions of ensuing futility. Wexler paired with Jordi Wheeler from The Occasion for an acoustic set on Hatch's show on WFMU a few years ago that is archived here. 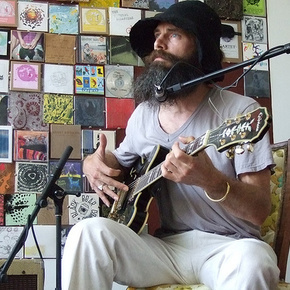 WFMU has had the good fortune to host several other artists from the Amish label that are now available to download on the FMA such as Theo Angell's performance on Maria Levitsky's Show. Angell began playing experimental folk music with Hall of Fame, but unlike Wexler his approach to folk is rougher, like something you might find on a field recording of primitive American music. His music facilitates somber meditations, like the mist in an early morning forest, obsfuscated shards of light wrangle to wake up the day from the night, yet these songs feel as comforting as mate and oatmeal on a wood stove. I never would have guessed all this was emanating from a Brooklyn loft as his ethos still seems firmly planted in his rural hometown in Oregon. Some of Angell's collaborators have also made appearances on WFMU, including P.G. Six and Hall of Fame on Irene Trudel's Show and The Stork's Club, respectively.